Hosts USA survived a tense semi-final battle against India in the WSF Women’s World Junior Team Squash Championship in Boston to set up a dream final with defending champions Egypt in the World Squash Federation event at the Murr Center at Harvard University. Amanda Sobhy, the world No20 and second highest-ranked player in the event, put the hosts into the lead with an 11-8, 11-8, 11-5 victory over Indian top string Anaka Alankamony, the reigning Asian Junior Champion. The tie was turned on its head when India’s second string Saumya Karki, a 16-year-old making her debut in the championship, played the game of her life to beat experienced Olivia Blatchford, a New Yorker ranked 37 in the world who has already represented her country at senior level, 11-7, 11-8, 11-9 in 28 minutes. The decider pitched US No4 Haley Mendez, a 17-year-old from New York, against India’s third string Aparajitha Balamurukan, also 17, from Chennai. Mendez squeezed home in the first, but Balamurukan upped the pace in the second to draw level. It was nip and tuck in the third and fourth games – but it was Mendez who held her nerve to take the final three points of the fourth to score a dramatic 11-8, 4-11, 11-9, 11-9 victory which delighted the packed crowd. 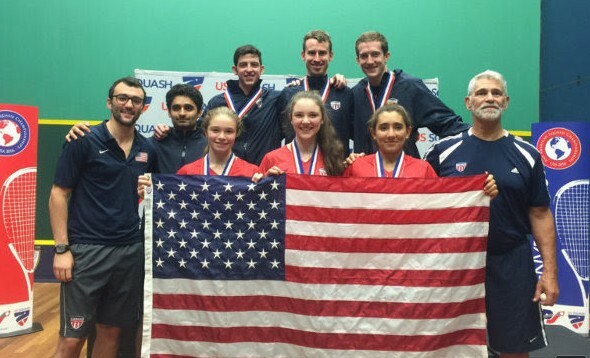 “Haley is so fit, she just kept on going, kept on running and worked so hard to pull that victory out for us,” team spokesmanJack Wyant told www.worldsquash.org/worldjuniors2011 after the USA celebrated its first appearance in the final. “Amanda was solid again. She’s saving her best squash for the final – she was gutted by the result in the individuals and tomorrow’s an opportunity to show that she’s at the same level as the World Champion. By comparison, favourites Egypt strolled into the final – for the fifth time in a row – after beating sixth seeds Hong Kong China 2/0. Egypt’s two world individual championships finalists Nour El Tayeb and Nour El Sherbini produced convincing displays – world champion El Tayeb beating Ho Ka Po 11-3, 11-2, 11-4 and former champion El Sherbini overcoming Ka-Yi Lee 11-5, 10-12, 12-10, 11-2.